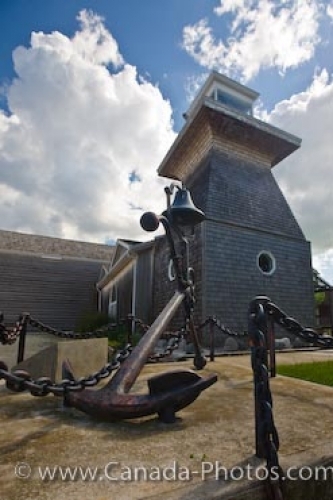 The anchor and bell display outside of the Visitor Information Centre in the town of Gimli in Manitoba, Canada. Outside the Visitor Information Centre in the town of Gimli, Manitoba, a large anchor and bell are on display which were once used on the SS Lady of the Lake between 1898 and 1929. This visitor information centre presents the natural history of Lake Winnipeg and the fisheries industries around the town of Gimli. Inside the centre, people can learn of the various things to do and see while touring the town of Gimli in Manitoba, Canada. Gimli is located on the west shore of Lake Winnipeg where visitors can stroll the sandy beaches, swim, fish, kayak or canoe. Gimli, Manitoba is located about 75 kilometers north of Winnipeg and is now known as New Iceland as it is home to the largest population of Icelandic ancestry outside of Iceland. Picture of the display outside the Visitor Information Centre in Gimli, Manitoba in Canada. Anchor and bell which once served aboard the SS Lady of the Lake (1898-1929) at the Visitor Information Centre in the town of Gimli, Manitoba, Canada.